At 8.45pm on this date, before their fourth and final live appearance at the Hulme Hall in Birkenhead, The Beatles recorded a radio interview for Radio Clatterbridge. It is the group's earliest surviving recorded interview. The station served two local hospitals, Cleaver and Clatterbridge. The Beatles were interviewed by Monty Lister, with additional questions from Malcolm Threadgill and Peter Smethurst. Lister presented two shows on the Radio Clatterbridge: Music With Monty and Sunday Spin. The Beatles had little experience to draw from – just three weeks had passed since the release of Love Me Do – and much of the interview was spent establishing basic information about the group. 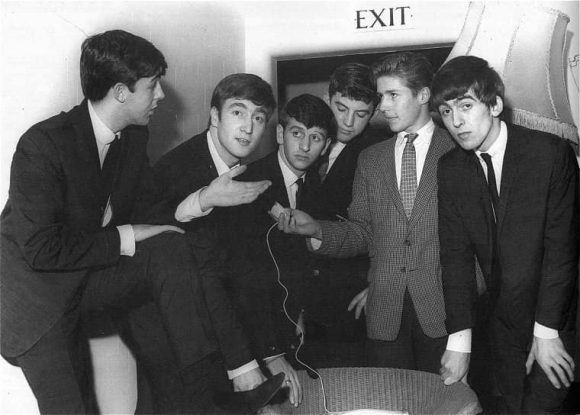 John Lennon spoke of working on Please Please Me in the hope that it would become their second single, and Paul McCartney notably described Lennon as The Beatles' leader. Mark Lewisohn's 1986 book The Beatles Live! contained a flexidisc of the interview, following which it was widely bootlegged. McCartney's comments about My Bonnie were included in the Anthology 1 album in 1995. Monty Lister: Well it's a very great pleasure for us this evening to say hello to an up-and-coming Merseyside group, The Beatles. Now I know their names, and I'm going to try and put faces to them. Now, you're John Lennon, aren't you?" Monty: What do you do in the group, John? John: I play harmonica, rhythm guitar, and vocal. That's what they call it. Monty: Harmonica, rhythm guitar, and vocal. Then, there's Paul McCartney. That's you? Paul: Yeah, that's me. Yeah. Monty: And what do you do? Paul: Play bass guitar and uhh, sing? I think! That's what they say. Monty: That's quite apart from being vocal? Monty: Then there's George Harrison. George: How do you do? Monty: How do you do? What's your job? George: Uh, lead guitar and sort of singing. Monty: By playing lead guitar, does that mean that you're sort of leader of the group or are you...? George: No, no. Just... well you see, the other guitar is the rhythm. Ching, ching, ching, you see. Paul: He's solo guitar, you see. John is, in fact, the leader of the group. Monty: I don't know whether we caught that or not, but I hope it went in. And over in the background, here, and also in the background of the group and making a lot of noise is Ringo Starr. Monty: You're new to the group, aren't you Ringo? Ringo: Yes, um, nine weeks now. Monty: Were you in on the act when the recording was made of Love Me Do? Ringo: Yes, I'm on the record. I'm on the disc. Ringo: (Comic voice) It's down on record, you know? Monty: What's that offensive weapon you've got there? Those are your drumsticks? Ringo: Well, it's um... just a pair of sticks I found. I just bought erm, you know, 'cause we're going away. And I've put my name on. And it's good, you know. That’s a pretty crowded publicity photo!